Last year’s Anchorage-area beluga whale count inspired a small army of citizen scientists. You can join them Saturday. On a Saturday in September last year, Kaiulani Rees and her husband, Don, stood at a Seward Highway pullout near Girdwood. They watched, entranced, as beluga whales fed on silver salmon alongside a harbor seal. 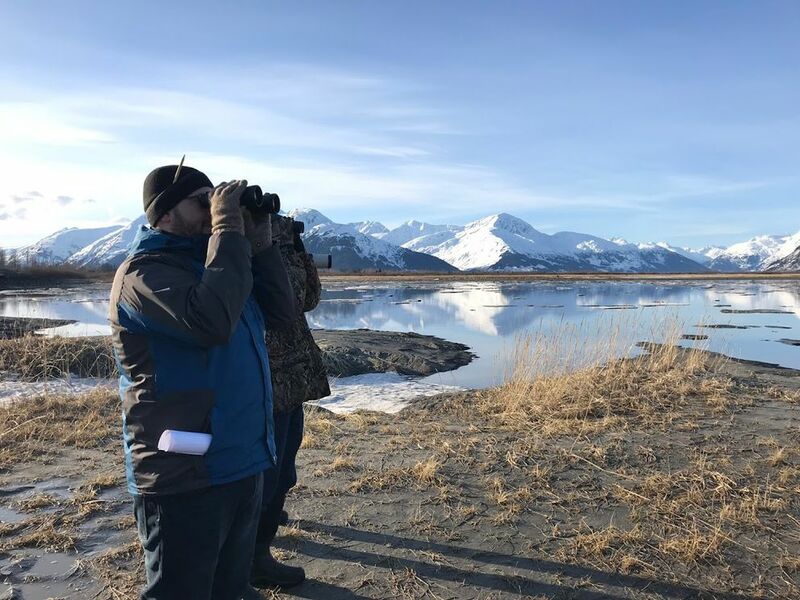 The occasion was the first-ever Beluga Count, an Anchorage-based event aimed at raising the profile of the endangered white and slate-gray mammals that live in Cook Inlet's silty waters. Since then, Rees has been taking photos whenever she can and submitting them to a research website that records beluga sightings. The Reeses are part of an upswell of enthusiastic citizen scientists that emerged from the inaugural Beluga Count. More than 2,000 people participated, and researchers have been inundated with text messages, photos and emails from people who hope to help efforts to learn more about the declining Inlet beluga population. With the second-ever Beluga Count set for Saturday, organizers only hope to build on last year's success. 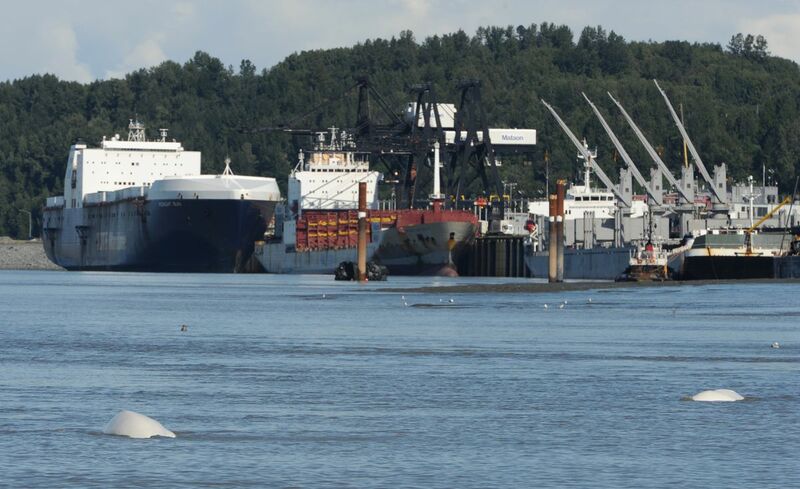 "It's not just on one day — (last year) spawned a whole bunch of people doing monitoring for us," said Verena Gill, the Cook Inlet beluga whale recovery coordinator for the National Oceanic and Atmospheric Administration's fisheries division. "We're getting great information." For the event, 14 public viewing stations will be staffed along Turnagain Arm from 10 a.m. to 1 p.m. In the afternoon, the event shifts to the Alaska Zoo. Free activities run from 1 to 5 p.m. and will include presentations, a "book nook" for younger children, virtual reality goggles and a marine debris obstacle course. More information is available at the NOAA Alaska regional office website. Oil and gas employees will participate from platforms in Cook Inlet, Gill said. Sign-ups for text-message alerts about beluga activity, as well as opportunities for citizen science efforts, will be available at the event, said Suzanne Steinert, the executive director of the Beluga Whale Alliance, a nonprofit formed last year to support public outreach about the whales. A diverse mix of government agencies, oil and gas companies, nonprofit conservation groups and university representatives helped plan the event. Gill, the lead organizer, said her dream is to harness local energy and enthusiasm to help scientists understand beluga behavior — the creeks they use, their feeding grounds, the number of calves. "I'm one person — it's a big inlet," Gill said. In the 1970s, an estimated 1,300 belugas ranged in Cook Inlet. Since then, the number has plummeted to just more than 300 and continues to decline. In 2008, the Cook Inlet belugas were federally listed as an endangered species. But the population hasn't rebounded, and researchers are puzzled about why. There are a lot of theories, Gill said, including water pollution, noise and the decimation of "cultural leaders," food limitations and older belugas that taught younger generations how to survive. At this point, Gill said, it will take much more data and monitoring for researchers to figure out how to help belugas recover enough to be removed from the endangered list. A photo identification project was started in 2005 to collect data and reports of sightings. Until about a year ago, most of the entries came from researchers, industry and government agencies. But lately, officials have increased efforts to involve non-scientists in the cause. A beluga recovery plan, completed in 2016, included a plank about an outreach event. From there, the idea for the Beluga Count was born, modeled after a bird count the National Audubon Society hosts at Christmas, Gill said. The data collected in the count isn't used to calculate population estimates, Gill said. It's just a one-day snapshot. But the information is useful for understanding beluga habitat and trends over time, she said. The Beluga Whale Alliance, the new nonprofit, is particularly focused on enlisting help for researchers and gaining a broader audience. Steinert, the director, lives in Girdwood and built the nonprofit out of her graduate studies in conservation. The nonprofit has been working to create a Girdwood-based program for community members to monitor belugas in the fall and spring, Steinert said. It's also testing the text-message service, through which people can report beluga sightings and receive alerts about whale activity. (Steinert stressed that texts shouldn't be sent while driving, and people should try to view belugas at designated pullouts instead of along highway shoulders). When Steinert hosted a "citizen scientist" workshop in Girdwood in mid-August, teaching people how to count belugas, Kaiulani and Don Rees were among the attendees. The couple moved to Alaska about six years ago. They wanted to see belugas but didn't know how to go about it, Rees said. "It took a while to start realizing how to find them, that they have a pattern," Rees said. The couple had a few experiences with belugas before the 2017 count. One group swam by while they were hiking near Hope, Rees said. She said she could hear the whales breathing. Now the couple go out as often as they can to viewing spots along Turnagain Arm. They pick up trash and caution tourists to be quiet when belugas draw near, because the animals are sensitive to sound. They've learned how the whales move with the tides. 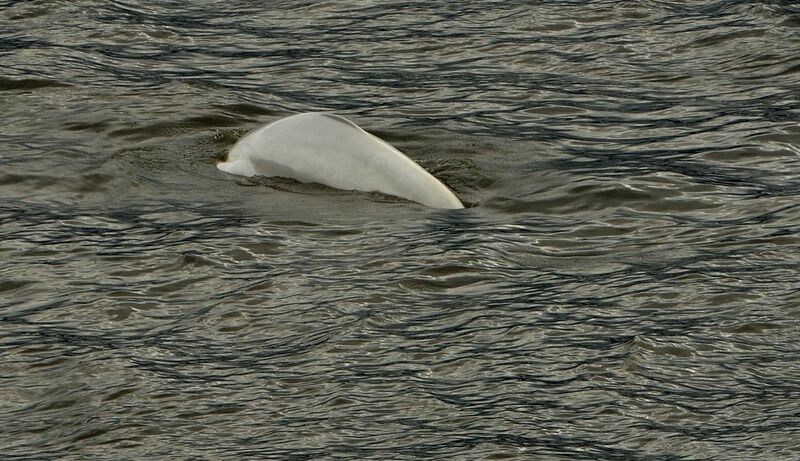 Rees has tried more recently to capture photos of belugas that show distinctive markings, like scars. 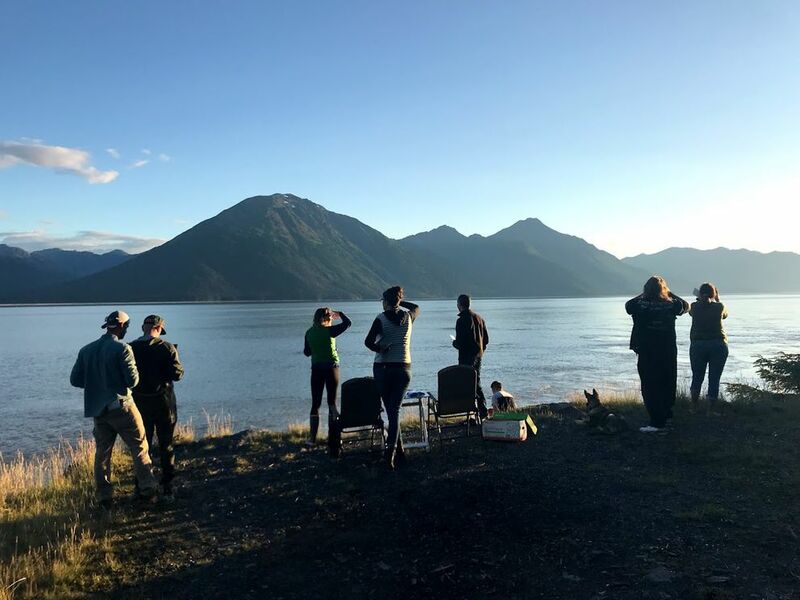 On Wednesday night, the Reeses returned to the spot between Bird Point and Girdwood where they participated in last year's Beluga Count. They saw dozens of belugas gathered to feed. The whales were also vocalizing, and it was magical, Rees said — a chorus of clicks, squeaks, bleats, moans, groans and whistles, and calls that sounded like a cork popping from a bottle.